Sneak peek of Hat-trick 18. 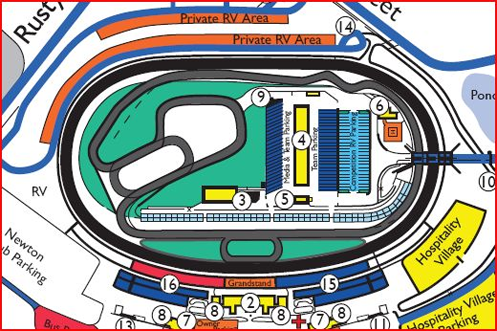 Oval, let's start a year with an easy one - road course isn't clear for me - not much info about it and according to this: http://theformulaexperience.com/wp-content/uploads/2014/01/iowa-road-course.png - that's not how it is made by Andrea. A little update about the rules for cars in International Endurance Series from Season 2017. 3.3. Every constructor can make max 3 cars. 3.4. Availability of each car depends on constructor's number of cars. 3.4.1. If constructor is going to create 1 car, it can be shared for max 3 teams. 3.4.2. If constructor is going to create 2 cars, they can be shared for max 4 teams. Every car should be used by at least 2 drivers, but can't be used by more than 6 drivers. 3.4.3. If constructor is going to create 3 cars, all of them can be shared for max 5 teams. Does this only count when constructors build 2 or 3 cars or does it count overall? If I create Lambda PN5 and PN4, both can be used by 8 drivers in 4 teams. But I can decide that e.g. only factory team will use Lambda PN5 and "satellites" will use PN4. Unless I'll give one additional PN5 for one driver - in this case there will be only 5 examples of PN4. I can also decide that factory team and 2 other drivers from satellite teams will use PN5 - in this case Lambda PN4 will be available for another 4 drivers. If I create Lambda PN5 + Lambda PN4 + Lambda PN3, all of them can be used by no more than 10 drivers. And as above, I can decide that e.g. Lambda PN5 will be exclusive factory car, and 4 satellite teams will get PN4 and PN3. Rules will be the same in case of 2 or 3 cars with random physic points, even if it's not said they are factory/exclusive cars (e.g. R-S LM16-F and R-S LM16-R by Daniel Rosenberger). It's just to answer any questions about 3 teams per car rule. the key point was ''Every car should be used by at least 2 drivers'', does that mean that every car must be used by at least 2 drivers or not? If there are 2 cars, the second one don't have to be used. But if it's used, the limits are active. I'm officially kicking off plans for GeneRally TCR Manager Series by IGRL Season 1. More details to follow. Another plan for the next season is to add 4 types of tyres (X-Soft, Soft, Hard and X-Hard). GRChA will decide which tyres are used in each round. GRTCC Season 7 will be last with short calendar. This intensity is more difficult to organizing than last year. Car model didn't change too much from previous season so you can just make an update of your car physic. I wanted to organize it in the past, but now when we didn't have Race Of Champions, I decided to back with this idea. Everybody will start on one track using two random cars; a total time of both "qualifying races" will decide about putting drivers in the Group Phase. Drivers are divided into Group A and Group B. Depends on the number of drivers, best 2 or 4 drivers in every group go to Play-Off. Every driver needs to make two races with another driver on the same track using random cars. The winner of each "match" gets 3 points, in case of draw drivers get 1 point. Quarter-Finals, Semi-Finals and Match for 3rd place will be on 3 races (first to 2 wins). Final match will be on 5 races (first to 3 wins). Tracks I wanted to use are mainly ROC-style tracks (Dammer, Bjorskliden, Prikosice, Wembley, Dusseldorf). I was going to start it in September 2017. Would anyone have any interest in me bringing back the management competition? I've been thinking about doing it again if there is enough interest. * First driver log in, download track and send pack later. Second driver log in, download track and save and send pack. An idea about rally, based on Arcade Mode from the game Mobil 1 Rally Championship. You're starting with AIs which you must "overtake" during the stage. BUT! the time from stages is not summed up. It only decides about your position on the next stage. Also, every driver (including AIs) starts the stage with time handicaps, depends on the previous stage. If you overtake some AIs despite the handicaps, you'll start next stage with higher position. It's a short event and won't be counted to GWR. Everything for fun and to test the new atypical system. I'd be interested in both the Arcade Rally and the 2 class Endurance race. Maybe the arcade rally could be fun. I'd join both too, Arcade Rally seems interesting but it'd really depend on the length of the stages . I was also fiddling with manager on our GRPL forum few months ago, even to the point that we began doing some real gameplay testing, but due to school & work I was forced to put it off for some time, but by the end of July I'll have finished the semester so I might be continuing it. I a nutshell, my goal was generally to minimize the randomness without making the game overcomplicated. The game is about managing real mid-pack F1 teams (nice scenario for 5-6 managers) and incorporated driver hiring & development, strategies in qualifying sessions, car development, basic economic model and individual car setups for each session. I don't know what kind of manager you were planning or whether you want to join forces at all, but if you feel it's your cup of tea we might even think about running it together. Thanks for the offer, but I've already got pretty much everything in place for my series. It is a fictional GT series run on fictional tracks, I've got an Excel management sheet that is all ready to go along with a large set of drivers. All I need is enough interest from managers Good luck with your series, too! Let me know if you get it started, I may join in.